The energy-saving Elektrox 200W Grow lamp operates at a mains voltage of 220-240 V and consumes a power of 200 W. The CE-marked CFL/ESL grow lamp from Elektrox is operated at a mains frequency of 50 Hz. 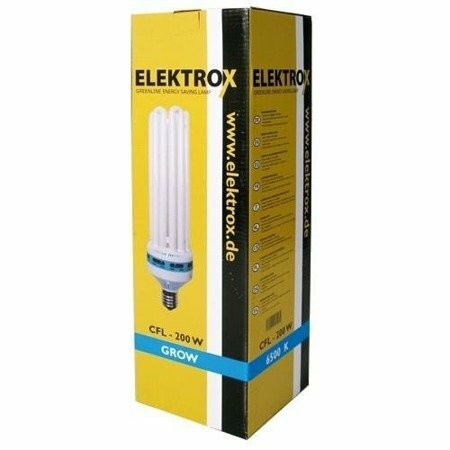 The Elektrox 200 W Grow energy-saving lamp consists of a milk white 6U tube with an E40 threaded fitting, and has an integrated ballast unit. Due to the outstanding luminous intensity of 9000 lm, this energy-saving lamp has an impressive lighting efficiency of 45 lm/W. With its colour temperature of 6400 K, a daylight white colouring and the white-blue colour spectrum, this grow lamp from Elektrox stimulates the growth phase of your plants in particular. Reflector required for operation !